I love lasagne but there are times when I’ve had a particularly carby few days when I just can’t hack more pasta/carbs. This recipe is therefore a perfect way of having a gorgeous, filling meal with no carbs and for hardly any points. The aubergines add such a nice flavour to the dish and make a really nice change to pasta. When I made this I made a (very!!) big batch of bolognaise sauce (enough to serve 8). I only use 500g of extra lean mincemeat but I pad it out with lots of veg (onion, mushrooms, peppers, courgette see my recipe for Bolognaise sauce here, this serve 4 as a bolognaise but padded out serves 8 in a lasagne or aubergine bake). This gave me enough bolognaise sauce to make a lasagne to serve 6 and two separate Aubergine bakes. If you are going to give this a whirl, your points may change if you use more or less of the sauce so point accordingly. I make this in individual lasagne dishes as I think they keep everything nice and combined and it means you have just enough Aubergine. If making for more than 2 people you could use a large lasagne dish but if so I would say use at least 1 aubergine per person and they are deeper and take more filling. The recipe below is therefore written for making in individual lasagne dishes. I served mine with a big green side salad. 1/4 jar of Dolmio light white sauce (I used the rest in a lasagne, you can replace with 20g Bisto cheese sauce if you are making without lasagne and don’t want to open a whole jar of white sauce but this makes the dish 8sp per person). Prepare the bolognaise sauce. Once cooked, take a griddle pan, spray with 1kal and heat up. Then griddle as many of the long slices of aubergine that will fit in the pan on each side for a minute or two, seasoning as you go, until they have softened and have a nice colour on either side. Pop onto a plate. 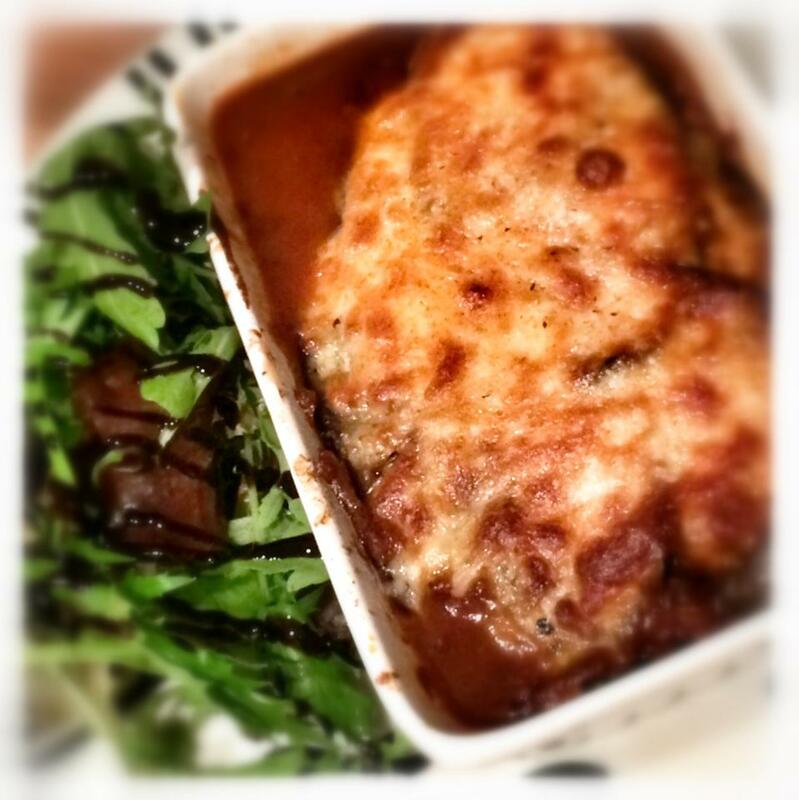 Once all the aubergine is griddled, take two small individual lasagne dishes and begin to layer up your bake. A thin layer of bolognaise on the bottom, topped with a couple of slices of aubergine, then a good tablespoon of white sauce spread out with the back of a spoon, a grating of nutmeg and then repeat until the dish is almost full (I got three layers of aubergine). Top the bake with the grated cheese and then the parmesan. Bake in oven for 20-30 minutes (until the cheese is cooked to your liking). Remove from the oven and serve on a plate with a nice side salad. This was ladt nights dinner and was beautiful! Ah glad you enjoyed and thanks for sharing!